Hey friends! A while a friend e-mailed me, asking if I could help her find some affordable dining room chairs. 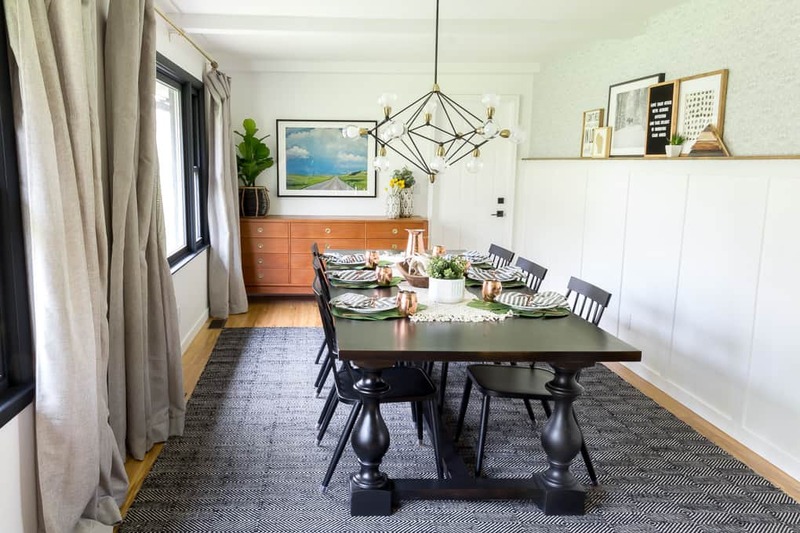 Her and her husband built an amazing dining room table, and saved a lot of money by doing it this way, but now she feels like all of their chair options will break the bank! 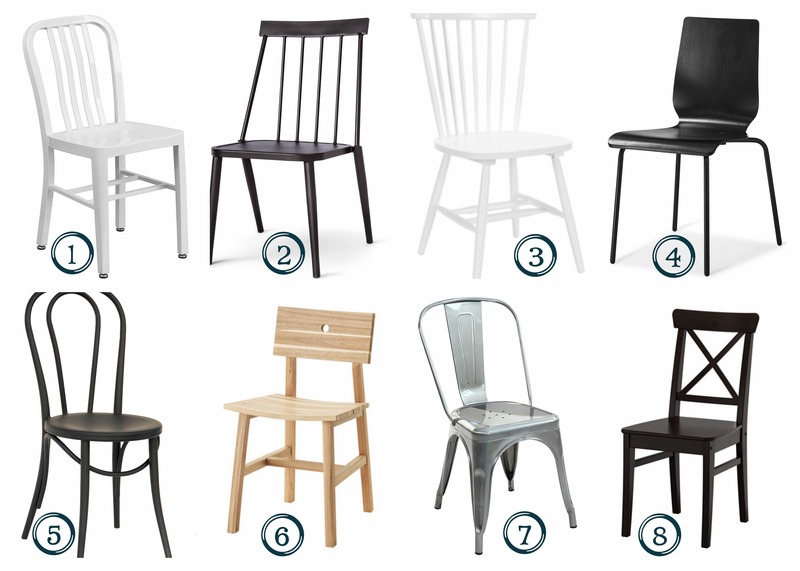 SO I rounded up a BUNCH of my favorite affordable modern dining chairs. 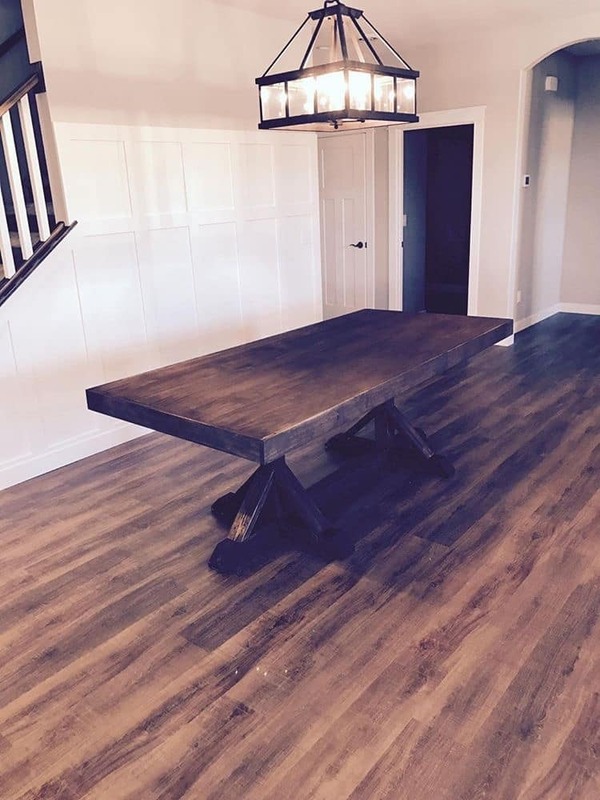 First though, check out this amazing table they built! 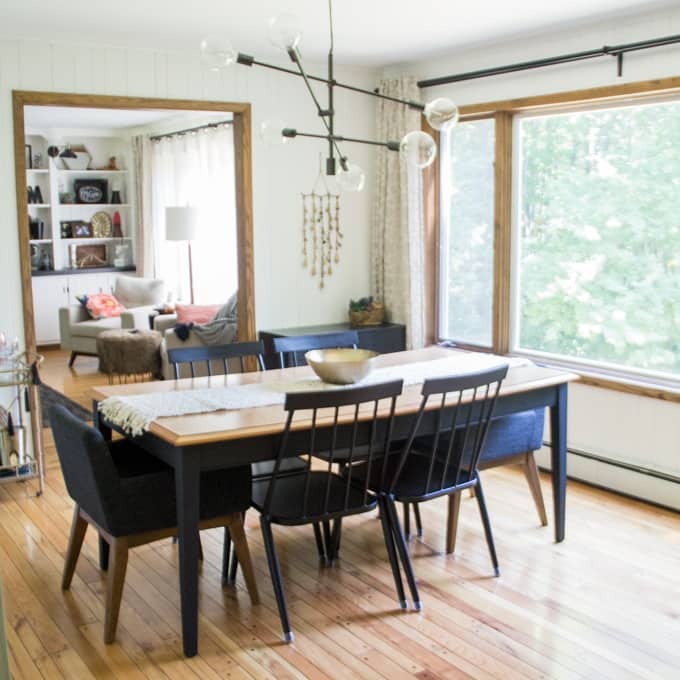 **Post Contains Affiliate Links** The definition of “affordable” can vary greatly from one person to another, but for the sake of my roundup I only included chairs that were under $50 each. Some were MUCH cheaper, others pushed the $50 limit. Because my friend’s table is wood, I stuck to mostly metal and painted chairs. Rather than trying to match wood I like the mix of metals and woods. If the table were glass or even a painted table I’d consider wood chairs, but in this case I think metal chairs would look best. In our last house I used these metal Windsor patio chairs from Target that I got on sale for $32 a chair! (Plus my 5% Target Card discount). Then recently I found a gorgeous black wood table at the Restoration Hardware Outlet, and I’m still using those black metal chairs with it. 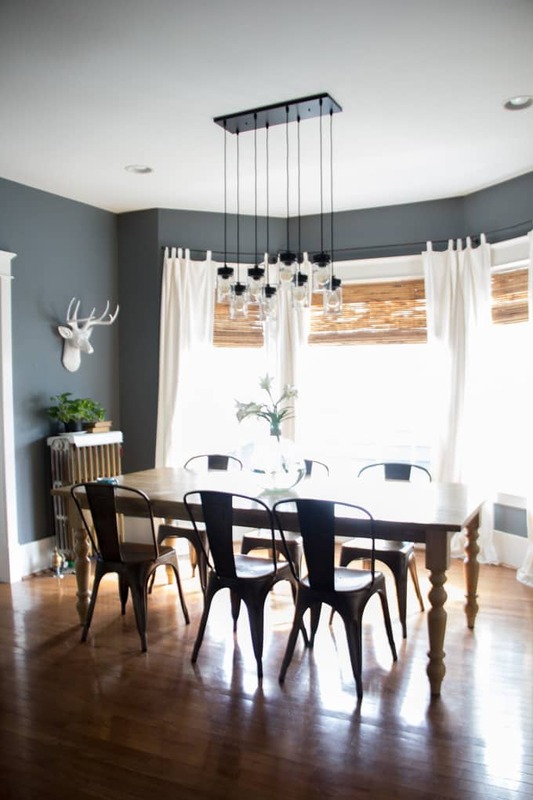 Here is the post about my current dining room. Remember my friend Heather’s house tour that I shared with you? In here dining room she has these metal chairs that are super affordable and look great, especially with the rustic wood of the table! 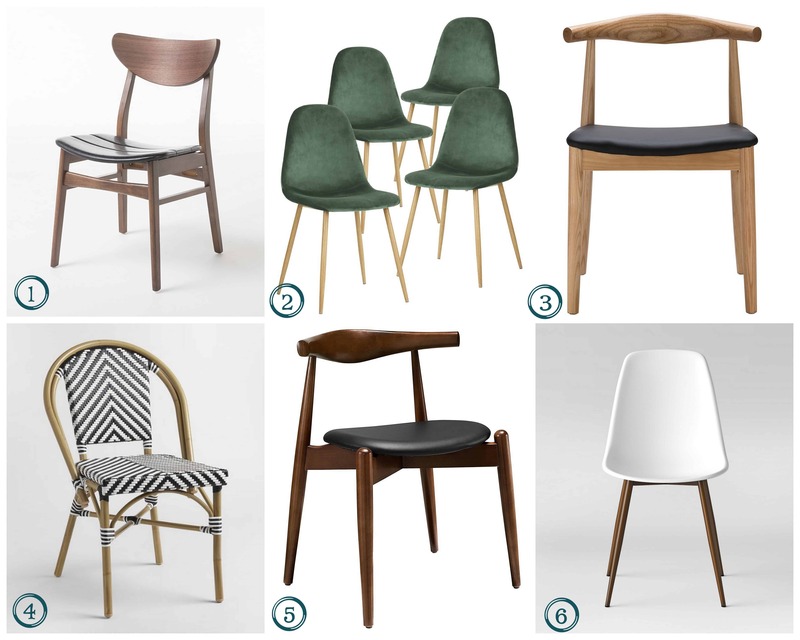 If you’re on the hunt for affordable dining chairs I hope this roundup helped! Thanks so much for stopping by to read! I’ve also included clickable links of each of the chairs below! (On mobile be sure to double click!). You have the best resources!! I never considered Amazon for chairs. Now I’m smitten with the green ones that they refer to as cactus. I’m not sure that I’ll order them because I have wooden chairs but these are less than buying cushions for my hard wooden chairs!! I did order velvet armchairs for the ends of my table and they are so comfortable. My wild wallpaper can handle the green color but I’m not sure it would look right. Ohh if I’d had this post earlier I’d be getting these chairs right away. So since I’m not ordering, will you?? They will be so much warmer in the winter!! Wink!! I thought about it but I’m not sure how well the paint would hold up. I have been considering it though!